The Environment Report, with Jeff Kart (Mr. Great Lakes). As heard in Bay City, Michigan, on Delta College Q-90.1 FM. For Oct. 25, 2013. 1 – How should Bay County manage its parks and recreation facilities in the next five years? Communities in the county are drafting a master recreation plan. The public is being asked to take a survey and submit comments. The plan will cover recreation for the county as well as participating cities and townships (Auburn, Bangor Township, Beaver Township, Essexville, Frankenlust Township, Fraser Township, Garfield Township, Gibson Township, Hampton Township, Kawkawlin Township, Merritt Township, Monitor Township, Mount Forest Township, Portsmouth Township, and Williams Township). Having an updated plan will allow the county and associated communities to seek grants in the future. You can take the survey via a link at BayCounty-mi.gov. 2 – How are your tax dollars being put to work for Great Lakes restoration? The federal Great Lakes Restoration Initiative has awarded more than $220 million since it began in 2010. The money has gone for habitat and wildlife restoration and protection projects across Michigan and other states in the Great Lakes region. A new database aims to showcase the work. The database was funded by the U.S. Army Corps of Engineers and created by the Great Lakes Commission. The database includes an interactive map of habitat and wildlife projects. It can be searched by keyword, and generate a fact sheet for each project, with information on goals and objectives. A search for Saginaw Bay brings up three projects, totaling almost $600,000, that focused on controlling invasive phragmites and improving fish passage. 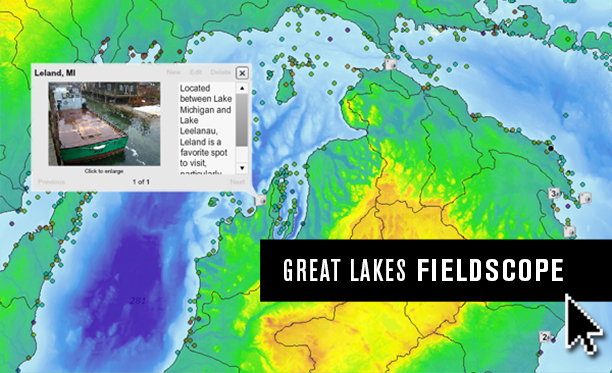 3 – There are new ways for students to learn about the Great Lakes. The educational tools come from Michigan Sea Grant, a joint effort of the University of Michigan and Michigan State University. The first is a website that offers lessons, related activities and data sets. The resources explore issues like climate and weather; lake effect snow and ice cover; harmful algal blooms, beach health and water quality, according to a news release. The second is a web-based mapping, analysis and visualization tool, hosted by the National Geographic Society. The Fieldscope can be used to investigate things like water quality or fish spawning grounds.